"Tara Sands's distinctive narration shows a deep understanding of Sammy Keyes, the multidimensional heroine of this series. 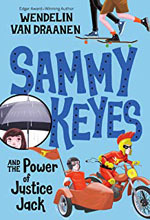 Sands is attuned to Sammy's empathy as the young investigator tries to determine whether an eccentric crime fighter in her town is a fake and help her BFFs untangle their relationship problems. Sands's rich portrayal of Sammy's bright and inquisitive nature shines as the middle-school detective seeks a missing woman and the cash that's disappeared with her. Despite the story's many characters, Sands's portrayals are individual and complex, and she deftly transitions between them. In addition, she conveys the author's sly ironic humor and the story's high-speed pacing. New listeners will join in easily, and Sammy's fans will love seeing how she's changing and growing."